I have a secret weapon in my beauty kit…drum roll…SALT SPRAY! It is the best thing that ever happened to my fine, limp straight hair. The purpose of salt spray is to give it that salty, gritty, textured feel your hair has right as you get out the ocean. I love it because it helps my hair to be styled without being rock hard and unmovable. I am lazy when it comes to doing my hair and I like having the messy not ‘done’ look. So, with a spritz of this and blast of the hair dryer and I am good to go. For the best result I would spray to damp towel dried hair or lightly spraying after you have styled then blow it over lightly with the hairdryer. Below are a few sprays I have tried and tested and highly recommend. I will do another step by step post about how I actually do my hair so you can see what a miracle this product really is! This was the very fist salt spray I ever used and it was a game changer for me. This has been used in my hair for practically every ‘do’ I have ever had at any event, red carpet or photoshoot. It great for up do’s to spray into damp hair and dry off for that extra texture and hold that your hair needs for long nights. 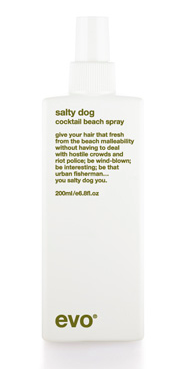 It is a great every day spray too – very gritty and leaves your hair with that salty sea feeling. I recommend only spraying 5-7 pumps of this one for everyday use onto damp hair to avoid it getting crispy. The best part of this spray the handle – it is so easy to pump from every angle! This spray is the bomb…..pardon the pun. I really like a lot of the products from O&M (their shampoo’s smell divine!) so I was keen to see what this spray was like. I was not disappointed. This spray leaves the grit but not the oily residue that other salt sprays can leave after a couple of hours. I love this product for the staying power – it lasts all day and still feels the same at the end of the day as it did when you first put it on. My hair really behaves itself when this is sprayed on! And…despite it’s small appearance it lasts a really long time. I bought this product in a mad dash to the store a couple of months ago when I had run out of my trusty sprays. The girl at the store told me this was their best seller for salt sprays. I am always up to try something new and recommended so I brought it home with me to try. I have to say, it is a winner. This is probably the lightest of the products I have used and give a subtle yet strong texture. I would recommend about 8-10 sprays for everyday wear for a good result.